Over the course of the Atlantic slave trade, Brazil received more enslaved Africans than any other country in the world—approximately 40 percent of all enslaved Africans landed in Brazil. This fact is often overlooked, and, with it, the rich, lengthy, and tumultuous story of slave escapes and rebellions in Brazil. 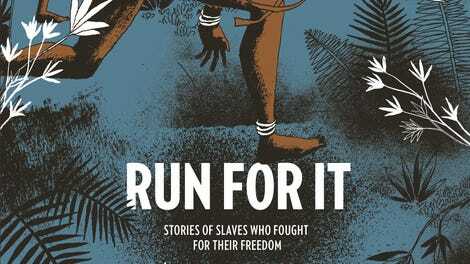 Recently translated from its original Portuguese, Run For It: Stories Of Slaves Who Fought For Their Freedom (Fantagraphics Books) brings these stories to the fore and informs readers about a history that has been obscured within American racial discourse. Authored by the Brazilian cartoonist Marcelo D’Salete, Run For It collects a number of short stories, each one offering a different perspective on the peculiar institution. But while the genre of slave narrative grows wearier and wearier with every iteration, D’Salete avoids many of the pitfalls that hobble the familiar slave narratives, which are typically authored by white writers. There are no white saviors, there are no sympathetic white liberals, there is no attempt to minimize the pain—physical, mental, spiritual—that slavery wrought on millions of people. But at the same time, D’Salete avoids falling into a cynical exploitation of that pain—another over-corrective mistake that white authors tend to fall into. Rather, D’Salete constructs a space of immense humanity. That is, characters and communities are here afforded depth, complexity, and a multitude of simultaneous emotions. He peoples his stories with love and loss, joy and struggle. Run For It resists the opportunity to fling sand in the eyes of readers and sting their vision. Instead, it is honest about its subject matter and masterful in its explication and rendering of that subject matter. The work that D’Salete’s use of ink does to achieve this affect cannot be overstated. Using clean, precise lines to delineate objects and figures, D’Salete alternates to thick smears of ink—the brushstrokes visible—to fill out and texture the compositions. The results are panels where finely rendered drawings surround details abstracted to the brink of unrecognizability. 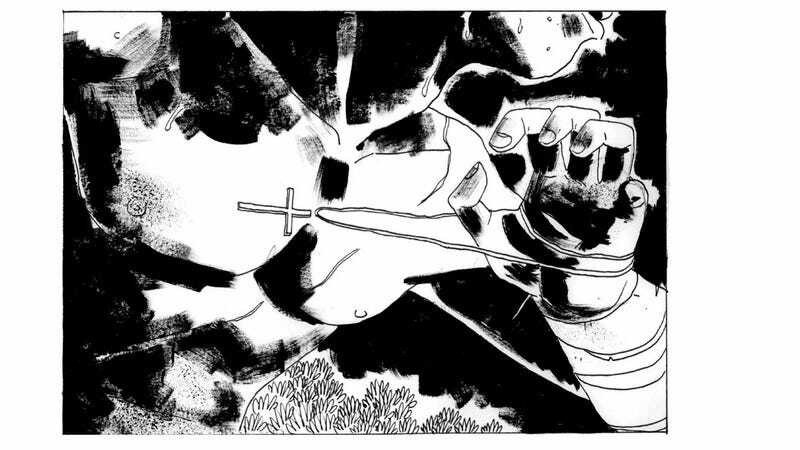 By oscillating between these two techniques, D’Salete manages to craft a comic that is, at some moments, incredibly naturalistic and, at others, incredibly stylized—without attenuating the power and dynamism of either aesthetic choice. In one panel, a slave overseer pulls a dagger from his chest, which D’Salete renders with an accomplished amount of naturalism; but the blood, which shoots out of the overseer’s chest, D’Salete renders as a kinetic explosion of ink. The panel mixes banality and extremity, stillness and movement, simplicity and complexity. This aesthetic allows D’Salete to produce arresting compositions—fever dream-like stages inhabited by subtle and affective actors—without sacrificing its vivacious energy. Simply put: Run For It is easily one of the most beautifully illustrated comics of the year. But the book isn’t simply gorgeous to look at: D’Salete uses his compelling images to move readers and to inform them, and, overall, the book is an incredibly accomplished work of cartooning.